Boko Haram’s goal of an Islamic Caliphate, starting in the Borno State in the North East that will eventually cover the areas of the former Kanem-Borno Empire, is a rejection of the modern state system forced on it by the West. 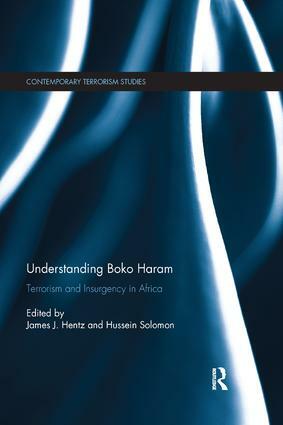 The central theme of this volume examines the relationship between the failure of the state-building project in Nigeria and the outbreak and nature of insurgency. At the heart of the Boko Haram phenomenon is a country racked with cleavages, making it hard for Nigeria to cohere as a modern state. Part I introduces this theme and places the Boko Haram insurgency in a historical context. There are, however, multiple cleavages in Nigeria ̶ ethnic, regional, cultural, and religious ̶ and Part II examines the different state-society dynamics fuelling the conflict. Political grievances are common to every society; however, what gives Boko Haram the space to express such grievances through violence? Importantly, this volume demonstrates that the insurgency is, in fact, a reflection of the hollowness within Nigeria’s overall security. Part III looks at the responses to Boko Haram by Nigeria, neighbouring states, and external actors. For Western actors, Boko Haram is seen as part of the "global war on terror" and the fact that it has pledged allegiance to ISIS encourages this framing. However, as the chapters here discuss, this is an over-simplification of Boko Haram and the West needs to address the multiple dimension of Boko Haram. James J. Hentz is Professor and Chair of the Department of International Studies and Political Science at the Virginia Military Institute, USA. He is author/editor of numerous titles, including the Routledge Handbook of African Security (2013). Hussein Solomon is Senior Professor in the Department of Political Studies and Governance at the University of the Free State, South Africa, and author of Islamic State and the Coming Global Confrontation (2016).